Aluminum tank trailer body structure simple process, by changing the cross-section increases the discharge flow rate, reducing the discharge time, separated by improve the structure of board positions, reducing the diaphragm plate by gravity and the vertical longitudinal impact caused by cracking of the diaphragm plate has played an effective role in protection by changing the diaphragm plate, to strengthen the position of the plate in the tank to a location one correspondence, the tank structure on the bending, torsional strength have improved, overall excellent mechanical properties, improve the production yield and quality. Looking for ideal Aluminum Tanker Trailer Manufacturer & supplier ? We have a wide selection at great prices to help you get creative. All the Tank Trailer for Fuel are quality guaranteed. 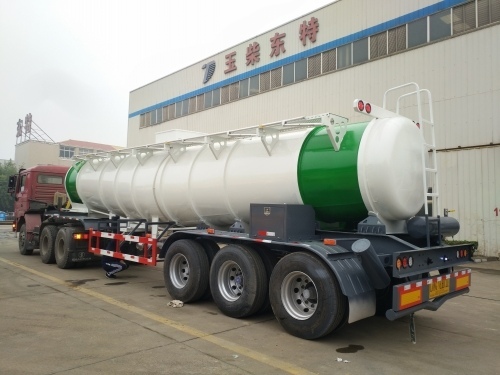 We are China Origin Factory of Tanker Trailer for Oil. If you have any question, please feel free to contact us.